Expired Listings Scripts. Real Estate Marketing Talk is loaded with information about expired listings. Type it into the search box and you'll get more than 970 results. Here's a look at some of the major pages. Here's an article I wrote back in 2005 about why Expired Listings Scripts were some of the best leads to go after even then. The same applies in today's market. A system that some work to near perfection focuses on Expired Real Estate Listings, which are a great source of leads. ... In seconds you'll have a complete update of all the expired listings for any time frame you want. Here's the last Expired Listings Scripts article. Enjoy! The most successful real estate agents have lots of listings, and although getting them is easier said than done, it's relatively easy to do - at least with the right system it is! 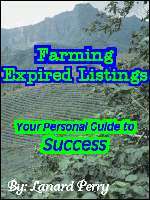 One system that works to near perfection is the Farming Expired Listings System, with letters. Learn how it can boost your business, too!